The National Fritters Day is a food-related holiday celebrated on December 2. Fritters are pan-fried or deep-fried cakes with a wide variety of fillings. Fritter batter is made with milk and egg and is similar to pancake batter. Fritters can be filled with fruit, vegetable, meat, seafood, cheese or other foods. Almost every cuisine in the world has its own variety of fritters. For example, tempura can be considered Japanese fritters. In the United States, corn fritters are a very popular savory snack. Apple fritters and zucchini fritters are also well known. Crab cakes and clam cakes can be considered varieties of fritter. 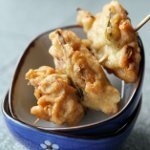 Fritters can be served not only as a snack, but as a dessert, side dish, or even the main course. To celebrate the National Fritters Day, cook your favorite fritters to enjoy. For example, you can make a plate of classic corn fritters. Heat 3 cups of oil in a deep fryer or heavy pot to 365 °F. In a medium bowl, combine 1 cup all-purpose flour (sifted), 1 tsp baking powder, 1/2 tsp salt, and 1/4 tsp sugar. Beat together 1 egg, 1/2 cup milk, and 1 tbs melted shortening. Stir into flower mixture and add 1 can whole kernel corn (drained). Fritter batter is dropped by spoonfuls into the hot oil and fried until golden. It is recommended that you drain fritters on paper towels.